The Oghuz (variously known as Ghuzz, Guozz, Kuz, Oguz, Oğuz, Okuz, Oufoi, Ouz, Ouzoi, Torks, Turkmen, Uguz, Uğuz, and Uz ) were a group of Turkic peoples. In the ninth century the Oghuz Turks from the Aral steppes drove the Pecheneg Turks of the Emba region and the River Ural toward the west. In the tenth century they inhabited the steppe of the rivers Sari-su, Turgai, and Emba to the north of Lake Balkhash of modern day Kazakhstan . A clan of this nation, the Seljuks, embraced Islam and in the eleventh century entered Persia , where it founded the Great Seljuk Empire. Similarly, in the eleventh century a Tengriist Oghuz clan—referred to as Uzes or Torks in the Russian chronicles—overthrew Pecheneg supremacy in the Russian steppe. Harried by another Turkic horde, the Kipchaks—a branch of the Kimaks of the middle Irtysh or of the Ob—these Oghuz penetrated as far as the lower Danube, crossed it and invaded the Balkans, where they were either crushed or struck down by an outbreak of plague, causing the survivors either to flee or to join the Byzantine imperial forces as mercenaries (1065). The Oghuz seem to have been related to the Pechenegs, some of whom were clean-shaven and others of whom had small 'goatee' beards. According to the book Attila and the Nomad Hordes, "Like the Kimaks they set up many carved wooden funerary statues surrounded by simple stone balbal monoliths." The authors of the book go on to note that "Those Uzes or Torks who settled along the Russian frontier were gradually Slavicized though they also played a leading role as cavalry in twelfth and early thirteenth century Russian armies where they were known as Black Hats.... Oghuz warriors served in almost all Islamic armies of the Middle East from the eleventh century onwards, in Byzantium from the ninth century, and even in Spain and Morocco." In later centuries, they adapted and applied their own traditions and institutions to the ends of the Islamic world and emerged as empire-builders with a constructive sense of statecraft. "The term 'Oghuz' was gradually supplanted among the Turks themselves by Türkmen, 'Turcoman', from the mid tenth century on, a process which was completed by the beginning of the thirteenth." 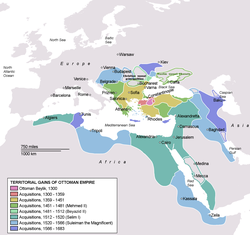 "The Ottoman dynasty, who gradually took over Anatolia after the fall of the Seljuks, toward the end of the thirteenth century, led an army that was also predominantly Oghuz." The name Oghuz is derived from the word ok, which means "arrow" or "tribe". The depiction of an archer shooting an arrow was the flag of the Seljuk Empire, founded by the Oghuz Turks in the 10th century. The designation of "Oghuz" was given to a series of Turkic tribes in Central Asia who had united into a new confederation. This socio-political union led to the emergence of a new larger inter-tribal Turkic entity, the Oghuz. The Oghuz gradually grew larger as various other Turkic tribes united during the Göktürk Empire in the 6th and 7th centuries. Oghuz is not an ethnic name, and it can be simply translated into "Turkic tribes." The "Oghuz Turk branch" or "Western Turk branch" is one of the traditional six branches of the modern Turkic peoples. The "Oghuz branch" is a geographical and historical designation, not a separate ethnic term since the Turkic peoples of the world share the same ethnic roots. They are referred to as "Western Turks" because they moved west from other Turkic peoples after the Göktürk empire collapsed, and because the majority of the areas in which they inhabit today (except Turkmenistan and the Turkmen Sahra) are west of the Caspian Sea , while those referred to as "Eastern Turks" live east of the Caspian Sea. "In 178-177 BC, the Xiongnu shan-yü Mao-tun subdued a people called Hu-chieh, west of Wu-sun. The early pronunciation of this transliteration suggests that they were ancestors of Oghur/Oghuz." The original homeland of the Oghuz, like other Turks, was the Ural -Altay region of Central Asia, which has been the domain of Turkic peoples since antiquity. Although their mass-migrations from Central Asia occurred from the 9th century onwards, they were present in areas west of the Caspian Sea centuries prior, although smaller in numbers and perhaps living with other Turks. For example, the Book of Dede Korkut, the historical epic of the Oghuz Turks, was written from the ninth and tenth centuries. According to many historians, the usage of the word "Oghuz" is dated back to the advent of the Huns (220 BC). The title of "Oghuz" (Oguz Khan) was given to Mau-Tun , the founder of the Hun Empire, which is often considered the first Turkic political entity in Central Asia. Also in the 2nd century BC, a Turkic tribe called O-kut or Wuqi 呼揭, 呼得, 乌揭, 乌护 who were described as a western hostility of Huns (referred to in Chinese sources, Shiji, 110 and Suishu, 84) were mentioned in the area of the Irtysh River , in present-day Lake Zaysan . It must be noted that the Greek sources used the name Oufi (or Ouvvi) to describe the Oghuz Turks, a name they had also used to describe the Huns centuries earlier. A number of tribal groupings bearing the name Oghuz, often with a numeral representing the number of united tribes in the union, are noted. The mention of the "six Oghuz tribal union" in the Turkic Orhun inscriptions (6th century) pertains to the unification of the six Turkic tribes which became known as the Oghuz. This was the first written reference to Oghuz, and was dated to the period of the Göktürk empire. The Oghuz community gradually grew larger, uniting more Turkic tribes prior and during the Göktürk establishment. Prior to the Göktürk state, there are references to the Sekiz-Oghuz ("eight-Oghuz") and the Dokuz-Oghuz ("nine-Oghuz") union. The Oghuz Turks under Sekiz-Oghuz and the Dokuz-Oghuz state formations ruled different areas in the vicinity of the Altay mountains. During the establishment of the Göktürk state, Oghuz tribes inhabited the Altay mountain region and also lived in northeastern areas of the Altay mountains along the Tula River. They were also present as a community near the Barlik River in present-day northern Mongolia . Their main homeland and domain in the ensuing centuries was the area of Transoxiana, in western Turkestan. This land became known as the "Oghuz steppe," which is an area between the Caspian and Aral Seas . Ibn al-Athir, an Arab historian, declared that the Oghuz Turks had come to Transoxiana in the period of the caliph Al-Mahdi in the years between 775 and 785. In the period of the Abbasid caliph Al-Ma'mun (813–833), the name Oghuz starts to appear in the works of Islamic writers. By 780, the eastern parts of the Syr Darya were ruled by the Karluk Turks and the western region (Oghuz steppe) was ruled by the Oghuz Turks. The militarism that the Oghuz empires were very well known for was rooted in their centuries-long nomadic lifestyle. In general they were a herding society which possessed certain military advantages that other societies did not have, particularly mobility. Alliances by marriage and kinship, and systems of "social distance" based on family relationships were the connective tissues of their society. Their cuisine included yahni (stew), kebabs, Toyga çorbası (lit. "wedding soup;" a soup made from wheat flour and yogurt), Kımız (a traditional drink of the Turks, made from horse milk), Pekmez (a syrup made of boiled grape juice) and helva made with wheat starch or rice flour, tutmac (noodle soup), yufka (flattened bread), katmer (layered pastry), chorek (ring-shaped buns), bread, clotted cream, cheese, milk and ayran (diluted yogurt beverage), as well as wine. Social order was maintained by emphasizing "correctness in conduct as well as ritual and ceremony." Ceremonies brought together the scattered members of the society to celebrate birth, puberty, marriage, and death. Such ceremonies had the effect of minimizing social dangers and also of adjusting persons to each other under controlled emotional conditions. Patrilineally related men and their families were regarded as a group with rights over a particular territory and were distinguished from neighbours on a territorial basis. Marriages were often arranged among territorial groups so that neighbouring groups could become related, but this was the only organizing principle that extended territorial unity. Each community of the Oghuz Turks was thought of as part of a larger society composed of distant as well as close relatives. This signified "tribal allegiance." Wealth and materialistic objects were not commonly emphasized in Oghuz society and most remained herders, and when settled they would be active in agriculture. Status within the family was based on age, gender, relationships by blood, or marriageability. Males as well as females were active in society, yet men were the backbones of leadership and organization. According to the Book of Dede Korkut which demonstrates the culture of the Oghuz Turks, women were "expert horse riders, archers, and athletes." The elders were respected as repositories of both "secular and spiritual wisdom." In the 8th century, the Oghuz Turks made a new home and domain for themselves in the area between the Caspian and Aral seas, a region that is often referred to as Transoxiana, the western portion of Turkestan. They had moved westward from the Altay mountains through the Siberian steppes and settled in this region, and also penetrated into southern Russia and the Volga. The extension from the Karachuk Mountains towards the Caspian Sea (Transoxiana) was called the "Oghuz Steppe Lands" from where the Oghuz Turks established trading, religious and cultural contacts with the Abbasid Arab caliphate who ruled to the south. This is around the same time that they first converted to Islam and renounced their shamanist belief system. The Arab historians mentioned that the Oghuz Turks in their domain in Transoxiana were ruled by a number of kings and chieftains. The Yörük, also Yürüks or Yuruks are a Turkic people ultimately of Oghuz descent , some of whom are still nomadic, primarily inhabiting the mountains of Anatolia and partly Balkan peninsula.Their name derives from the Turkish verb from [Eastern Turkish dialekt (Çagatay dialekt]- yörü "yörümek" , but Western Turkish dialekt (Garbi Türkçe) yürü- (yürümek in infinitive), which means "to walk", with the word Yörük or Yürük designating "those who walk, walkers". The Yörük to this day appear as a distinct segment of the population of Macedonia and Thrace where they settled as early as the 14th century. While today the Yörük are increasingly settled, many of them still maintain their nomadic lifestyle, breeding goats and sheep in the Pindus (Epirus, Greece and southern Albania ), the Šar Mountains (Republic of Macedonia ), the Pirin and Rhodope Mountains (Bulgaria ) and Dobrudja. An earlier offshoot of the Yörüks, the Kailars or Kayılar Turks were amongst the first Turkish colonists in Europe, (Kailar or Kayılar being the Turkish name for the Greek town of Ptolemaida which took its current name in 1928) formerly inhabiting parts of the Greek regions of Thessaly and Macedonia . Settled Yörüks could be found until 1923, especially near and in the town of Kozani . The Yörüks are credited with the conversion to Islam in the 18th century, after a period of cohabitation, of a part of the native Meglen Vlachs of Greece who in 1923 were expelled to Turkey under the terms of the population exchange between the two countries. A Turkmen man of Central Asia in traditional clothes, around 1905–1915. The terms "Turkmen" and "Turcoman" were often used as a designation for the Muslim-Oghuz Turks (Azerbaijanis, Turks of Turkey, Central Asian Turks) in periods of history although other Turkic factions described as Turks (Kumans, Khazars, Uyghurs, etc), and the ethnic name that the modern Turkmens of Central Asia use to designate their nationality was formed later. Turkmen girl in traditional dress. Although a term most commonly used for the Oghuz of Central Asia, the name "Turkmen" or "Turcoman" once applied to Azerbaijanis and the Turks of Turkey as well, distinguishing between other Turks and non-Muslim Turks. Some western books which were written prior to the modern age use the terms "Turcoman" for the descendants of the Oghuz Turks who were not from the Turkmen nationality of Central Asia, which is one of the branches of the Oghuz. For example, it is written in many sources prior to the modern age that the largest component of the population of Azerbaijan is composed of "Turcoman tribes." The "Turkmen" reference in history books which is often used for Azerbaijanis and Turks of Turkey simply means "Muslim Turk" or "Muslim western Turk," which means Oghuz Turk. In Turkey the word "Turkmen" refers to nomadic Turkish tribes (all Muslims), some of whom still continue this lifestyle. Oghuz Turkish literature includes the famous Book of Dede Korkut which was UNESCO 's 2000 literacy work of the year, as well as the Oguznama and Köroğlu epics which are part of the literary history of Azerbaijanis, Turks of Turkey and Turkmens. The modern and classical literature of Azerbaijan, Turkey and Central Asia are also considered Oghuz literature, since it was produced by their descendants. Grousset, R. The Empire of the Steppes. Rutgers University Press, 1991, p. 148. Grousset, R. The Empire of the Steppes. Rutgers University Press, 1991, p. 186. Hupchick, D. The Balkans. Palgrave, 2002, p. 62. Lewis, G. The Book of Dede Korkut. Penguin Books, 1974, p. 10. Torday, L., Mounted Archers: The Beginnings of Central Asian History. The Durham Academic Press, 1997, pp. 220-221. Oguz entry, Encyclopaedia Britannica Online.